Pilots have a number of essential pre-flight duties, and a limited amount of time to complete them. 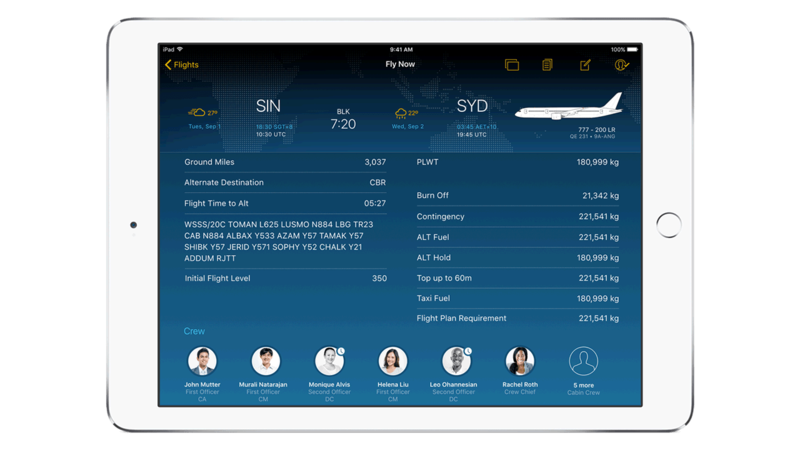 With Fly Now for iPad, pilots have one place to view all relevant flight information, receive real-time push notifications on flight plan updates and collaborate with the crew – long before they reach the airport. Fly Now improves pilot productivity with personalized content based on pilot preferences, prioritization of based on analytics – and collaboration tools – to connect the pilot with assigned crew. It enables pilots to act faster to changing conditions on the day of the flight. Using a Touch ID, pilots can review all relevant documents and information for that flight in the dashboard view on iPad. It also enables pilots to use FaceTime with the current crew in charge. Based on analytics, the app prioritizes for pilots the relevant sections of the flight plan, based on information like weather conditions, fuel load, aircraft type and route.